← GREAT PRIZES if you come to the 7th Annual Havens Poker + Casino Night TONIGHT! On Friday, April 17th at the end of the week after Spring Break and a week before Piedmont’s Spring Fling, the Havens Dads Club will host the first ever Spring SWING!Fathers bring your daughters, mothers bring your sons! However your family is made up, come all or come one!Our fun-loving Havens kids, moms and dads will dance and swing the night away to great music, disco lights, and a fog machine. Semi-formal attire recommended: dads/boys in coats/shirts and ties, moms/girls in Spring dresses! Admission price includes an entertaining night of music, dancing, dinner catered by Top Dog and a super fun photo booth to capture wonderful memories! Tickets at the door will be $20 per person, still cheaper than going to dinner and a movie, but much more fun and memorable! Please RSVP to the Evite, register online at Eventbrite and tell your kids about it! Hope your family can make it to this first ever Havens school dance and community FUNraiser! 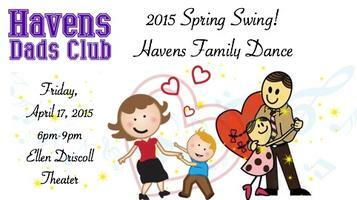 See you at the Havens Spring SWING!